So you have your brand new smoker and you are excited about using it. Before you go ahead you need to season your smoker. This is “seasoning a smoker” but you may have heard it called curing or pre-seasoning. It is the same thing. You must complete this seasoning process before you use your new smoker. In this article, we will show you the simple steps that you need to perform to do a good job. There may be other methods around but what we will show you is a tried and tested a way to prepare your smoker for cooking great tasting food. 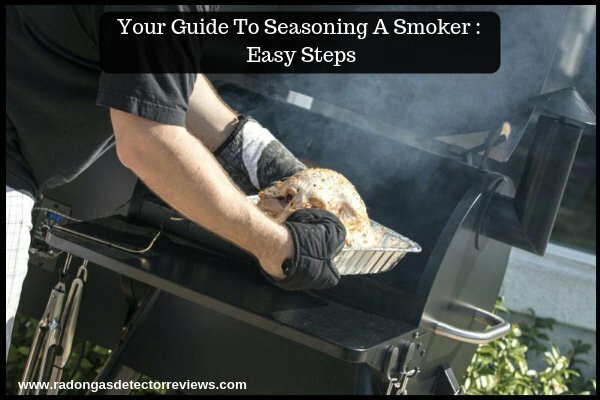 Why should you bother with Seasoning a Smoker? Most new smokers come with a thin film of oil applied inside. This thin oil film prevents the smoker from rusting. When you season your smoker you will eliminate the debris and destroy any contaminants present. The process will also help to bake the paint and seal the pores of your new smoker. Once you have assembled your smoker you need to prepare it for use. When you go through the seasoning process you will get rid of any contaminants that could end up spoiling the food that you cook. Sometimes the manufacturer may use glues and solvents and these can be harmful to health when heated up. You need to give your smoker really good clean. This includes the racks, the interior, the pans and the grates. Some smoker seasoning guides will tell you that just using water is enough for cleaning but we recommend that you use dish soap and water for a more thorough job. When you use dish soap it contains a degreaser which is necessary for the removal of oils used by the manufacturer as well as other the removal of other debris. You do not want to scratch your new smoker so use a soft cloth when you are cleaning. After you have cleaned everything properly let everything dry in the air. Your smoker must be completely dry before you do this. You can use olive oil or ordinary cooking oil for this process. Be careful with how much you apply here. It is not desirable to have excess oil running all over the inside of your smoker. Pour your oil into a spray can or use a flourless cooking spray from the store. It is vital that you reach all of the corners and edges inside your smoker with a thin film of oil. Pay special attention to this step. It is a good idea to cover the racks and cooking grates that came with your smoker while you are applying the oil. Most modern smokers have a water pan and you don’t need to apply oil to this. With an electric smoker, you need to be very careful that oil does not end up in the electric heating element. If you have a gas smoker then avoid any oil making contact with the burner or burners. Once you have applied the oil let it sit for a while. OK, now it is time to turn on the heat with your smoker. When you do this you will burn off any remaining debris left by the manufacturing process or shipping. Some smoker manufacturers recommend different time periods and temperatures for the heating process. In general, it is good to reach the maximum temperature of your smoker gradually and then leave it for 2 to 3 hours. All you want to do here is simulate smoke. Be sure not to add anything to the smoker when you are heating it for the first time. If you have an electric smoker then we recommend that you set it to the highest temperature and leave it heating up for at least an hour. You will receive instructions with your smoker so read these carefully and follow them. The same applies to a gas smoker. With a charcoal smoker, you will need to use a chimney starter so that the coals reach the desired temperature. Add some wood to the pan. You will not need to use the water pan for the heating process to take this out before you begin. If you have a charcoal smoker then be sure to open the vents really wide. This will help with reaching high temperatures as well as with the flow of the heat. Heat your charcoal smoker for at least an hour or until you burn all of the coals. Again you need to check for any specific instructions here. Perform a similar heating procedure if you have a pellet smoker. Add pallets to the hopper and then set the temperature to maximum heat. Heat your smoker for at least one hour and check your instructions to see if you need to do anything else. Once you have completed the heating process open up the grill so that the fire burns out and everything can cool down. Some of the more expensive smokers will require less seasoning work as they have a special coating on the inside. Again you need to read the instructions. Congratulations you have now seasoned your smoker! Now you are ready to add your food for some of the greatest smoky flavours you have ever experienced. It is important that your smoker does not rust so you can add oil to the outside of it to prevent this. When you have used your smoker for a while it is a good idea to re-season it. You may have experienced spillages or a buildup of grease or charcoal on the walls inside your smoker. We also recommend that you season the grates of your smoker before you first use it. Often manufacturers use the same oils on the grates as they do on the rest of the smoker. Every time you use your smoker after seasoning it be sure to wash the grates thoroughly. Taking the time out for seasoning a smoker is very important. You do not want to taint the taste of your food and you certainly want to avoid any harmful substances that may exist after manufacture. Take care of your smoker and it will take care of you.